You may remember that we had several popular tools for Battlefield 3, including BF3 Borderless. We have built on what we learnt from producing that tool, and have rewritten most of the code from the ground up to be more stable, reliable, and optimised. Many of the feature requests we got for BF3 Borderless have been included in BF4 Borderless, and all of the known bugs should be fixed. Unlike the previous games in the series, Battlefield 4 already has a native borderless option. For that reason, we were originally not planning to release a BF4 Borderless tool. However, we received an overwhelming number of requests for this tool due to the poor native implementation in Battlefield 4. Therefore, BF4 Borderless is back by popular demand, and we are offering it as an alternative solution. BF4 Borderless will automatically detect Battlefield 4 when it runs, at which point it will force it into a borderless window. You may disable this feature if you wish. You can also enter a custom size for the game window, and can choose to have it automatically centred on your screen. A screenshot of this program is included below. If you would like to see more, then check out the screenshots page on our BF4 Borderless microsite. This tool is awesome, I already used it in BF3. Thank you so much! One thing that would be nice is I’d like to choose which corner the game appears (it’s top left atm). Again, thank you very much for this tool! But why? 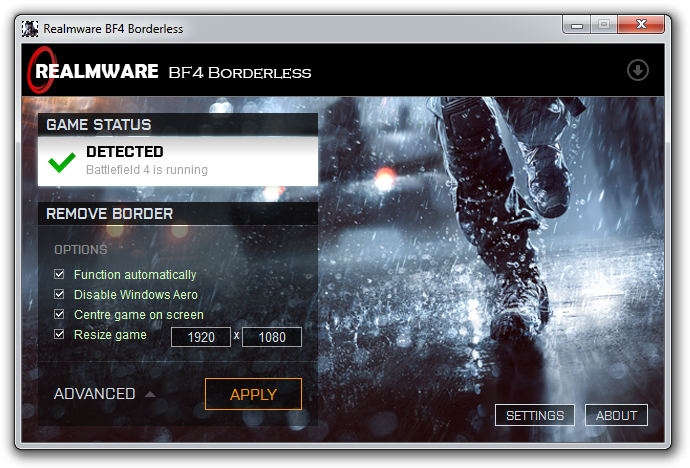 Borderless is supported out of the box with BF4. After one of the recent BF4 patches I’m not longer able to change Throttle Down for the jet. The default is “S” and despite changing it to “D” using the BF4 Settings Editor, the “D” key does absolutely nothing after I launch the game. If I press the “S” key it does throttle down in addition to Yaw Left which is what I have “S” set to. Basically works, but crashes each time I try to change and save settings.